Are You Smarter Than A Squirrel? 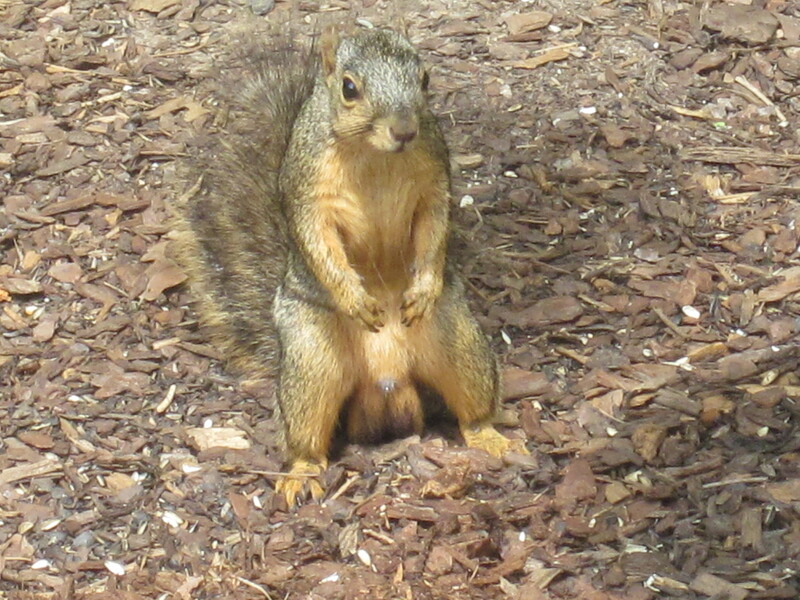 Just for fun, I must tell you the story of Sandy’s squirrel. Sandy’s Squirrel lives in the trees behind her house. Sandy and Paul have love to feed the birds, especially the beautiful family of cardinals who come and indulge in the sunflower seeds from their feeder. However, there is a neighborhood squirrel who also likes to indulge. Paul does not like the squirrel stealing all the birds’ food, so he has taken some action to prevent Mr. Squirrel from dining. First, he bought a squirrel guard to place on the pole holding the birdfeeders. Next, he lowered the squirrel guard so the squirrel could not stand on it and reach the bird feeder. Next he trimmed the branches of the trees around the stand. After that, he moved the birdfeeder away from the trees. Finally he cut down the tree closest to the birdfeeder. The entire process had provided wonderful entertainment outside the kitchen window. That is one wily squirrel!Must have some great food in those feeders. Looks like he or she loves a challenge, let’s see what these wise men can do next. smart money is on the squirrel.